An expansion pack entitled Diablo: Hellfire was released in 1997 by Sierra Entertainment. In 1998, Electronic Arts released Diablo for the Sony PlayStation. This version, developed by Climax Studios, featured direct control of the main character's direction, as opposed to point-and-click movement, using the PlayStation controller. A Sega Saturn version was considered by Electronic Arts but never released. The game's level of success led to two sequels: Diablo II in 2000 and Diablo III in 2012. Five years later, to celebrate Diablo's 20th anniversary, "The Darkening of Tristram" quest was added to Diablo III in early 2017. Diablo is an action role-playing hack and slash video game. The player moves and interacts with the environment primarily by way of a mouse. Other actions, such as casting a spell, are performed in response to keyboard inputs. The player can acquire items, learn spells, defeat enemies, and interact with non-player characters (NPC)s throughout the game. The dungeon levels are randomly generated, although they follow parameters according to their type; for instance the catacombs tend to have long corridors and closed rooms, while the caves are more non-linear. The players are assigned a random number of quests from several tiers; these quests are optional but help to level up the character and/or reveal more of the backstory. The final two quests, however, are mandatory in order to finish the game. A warrior engages in combat with a ghoul enemy. A "Level Up" button indicates the character has attribute points available to distribute. The icon at the lower right indicates that the character's head protection is damaged and in danger of breaking. Diablo has three character classes: the Warrior, the Rogue, and the Sorcerer. Each class has a different level of assigned attributes along with a unique skill. Each class is capable of using almost all of the same items and spells, in contrast to later titles in the Diablo series which have class-specific items and spells. However, the limitations in the attributes for each class reward play that utilizes them efficiently; for instance the Warrior's low maximum level of Magic prevents him from learning the higher levels of powerful spells like the Sorcerer, instead the Warrior is best suited to melee with a faster weapon swing plus a "critical strike" for bonus damage. Warrior: The most physically able of the three classes. The Warrior is a close-quarters fighter and can generally take the most physical punishment. The Warrior's primary character attribute is Strength. The Warrior starts with the skill to repair objects in his possession at the cost of overall durability. Rogue: A master of ranged weapons. While not as strong as the Warrior, the rogue is very effective at attacking enemies from a distance with the bow. The Rogue's primary character attribute is Dexterity. The Rogue's unique starting skill is the ability to disarm traps. Sorcerer: A spellcaster being the most physically weak of the three classes, but can learn the most spells at the highest levels. The Sorcerer's primary character attribute is Magic. The Sorcerer's unique starting skill is the ability to recharge spell staves at the cost of lowering the maximum number of spell charges that the staff can hold. In the expansion set, Diablo: Hellfire, the Monk was added. The Monk was meant to be proficient at melee combat with the staff, and is not related to the Monk class in Diablo III. Two other classes, the Bard and Barbarian, were unfinished but remained hidden characters in Diablo: Hellfire, and could be enabled using a hack. Using the in-game sprites of the Rogue and Warrior, respectively, the Bard is capable of dual-wielding weapons while the Barbarian was a two-handed axe specialist. Many items have attribute minimums to be used effectively. White-colored items are normal items, blue-colored items are magic items and gold-colored items are unique items. Any items that are not white in color must be identified to make use of their magical effects, however, characters can use unidentified items as they would the base item. Items wear down through use and only have a certain amount of durability. When an item's durability is zero, it is destroyed. Players can return to the town and pay a fee to an NPC, Griswold the Blacksmith, to have the items restored, while the Warrior can repair objects in his possession at the cost of overall durability. Bows are the ranged weapon of the game, best used by rogues. Staves, while capable of physical attacks, are mainly used for the spell charges that they contain, as casting from a staff does not require the player to learn the spell or use mana. A staff's spell can only be cast a certain number of times before it requires a recharge. Swords are typically one-handed (though two-handed varieties also exist), while axes are all two-handed. Maces and clubs add a 50% damage bonus against the undead. Shields, when paired with single-handed weapons, allow attacks to be blocked. There are three classifications of armor: light, medium and heavy. Characters are also allowed to wear a helmet, two rings, and one amulet. Books contain spell formulas. Spell books cannot be used more than once, but multiple books of the same spell will increase the spell level, up to a maximum of 15. Scrolls allow use of both spells not yet learned, and spells not available in book form. They vanish after one use. Many potions are available for use, including health and mana restoration, and elixirs that increase statistics. Multiplayer can be done with up to four players. Multiplayer characters' states are saved periodically. Players can either be aggressive towards, or play co-operatively with, other players. Players can connect by one of the following: direct connection, modem connection, Battle.net connection or IPX network connection. The game lacks the stronger anti-cheating methods of Blizzard's later games and as a result, many characters online have been altered in various ways by common third-party programs known as trainers and/or game editing programs such as Cheat Engine. The setting of Diablo includes the mortal realm which is the world of Man as well as the High Heavens and the Burning Hells. :61, 62, 64 & 72 After eons of war between angels and demons, the ascension of man prompted the three Lords of Hell (including Diablo himself) to seek victory through influence, prompting their exile into the mortal realm. There, they sowed chaos, distrust, and hatred among the humans of Sanctuary until a group of magi, called the Horadrim, trapped them in enchanted crystals called "Soulstones". Diablo's soulstone was buried deep in the earth and a monastery was built over the site. Generations passed and the purpose of the monastery was forgotten. A small town named Tristram sprang up next to the monastery's ruins. When King Leoric rebuilt the monastery as a cathedral, Diablo manipulated its archbishop, Lazarus, to destroy his soulstone prison. Diablo subsequently possessed the king, sending out his knights and priests to battle against peaceful kingdoms, and then possessed the king's son, Prince Albrecht, filling the caves and catacombs beneath the cathedral with creatures formed from the young boy's nightmares. Tristram became a town of fear and horror, where people were abducted in the night. With no king, no law, and no army left to defend them, many villagers fled. One of the things that we were trying to get with Diablo was ease of gaming. The NHL series was really good at this, where you just click and you're in the game. Before Diablo, when you created a character, you had to answer 53 questions about this that and the other; you had to name it, give it a backstory and so on. We just wanted to get in and start smashing things. Diablo was conceived by David Brevik during the development of the fighting game Justice League Task Force (1995), developed by Japanese studio Sunsoft with two American studios, Condor Games (later Blizzard North) on the Sega Genesis version and Silicon & Synapse (soon renamed Blizzard Entertainment) on the SNES version. Condor, Brevik's studio, was initially unaware of the SNES version, but eventually became acquainted with that version's co-developer Blizzard, who they found to have a similar interest in PC gaming. Condor's proposal for Diablo, then a turn-based role-playing video game, was turned down by other publishers on the grounds that "RPGs are dead" before Blizzard took an interest after the idea was pitched to them in January 1995. Blizzard, coming off the success of real-time strategy Warcraft: Orcs & Humans (1994), requested two major changes, to make it real-time and to have multiplayer. Brevik also designed a "modern and cool" interface intended to bring the quick directness of console games as well as Doom (1993) to computer RPGs. During development, Condor was eventually renamed Blizzard North. The basis of Diablo was the 1980s roguelike game Moria; Bill Roper later said that the team's "initial pitch, in a nutshell, was to take the excitement and randomness of games like Moria, Nethack, and Rogue, and bring them into the 1990s with fantastic graphics and sound". The switch from turn-based to real-time gameplay occurred roughly six months into production. According to Matt Barton, the game Telengard, released by Avalon Hill in 1982, influenced the development of Diablo. Barton and Bill Loguidice also cite The Legend of Zelda series as an influence on Diablo, particularly its move towards real-time action, away from the stat-heavy, turn-based gameplay of earlier computer RPGs. At first, Diablo was a turn-based role-playing game, but later in development, also influenced by the previous success of Warcraft: Orcs & Humans, they decided to make it a real-time action game. The game was also originally conceived to be made in claymation (much like ClayFighter), but they decided to have a 3D isometric style instead. The music of Diablo was composed by Matt Uelmen. The soundtrack consists of six tracks. It was released after 15 years, in 2011. Diablo normally requires the original CD to play, however also included on the disk is a shareware version of the software that could be played without the CD called Diablo Spawn. This version of the game allows access to the first two areas of the dungeon, and locks out two of the three playable classes and many of the NPC townsfolk. It is playable in both single- and multi-player with those restrictions. The demo is also downloadable. In 2019 Diablo was released digitally on GOG.com with minor enchancements. According to Max Schaefer, Blizzard's initial sales estimates for Diablo were modest. He remarked, "We were thinking that if everything went well, we would sell 100,000 copies." Following the game's positive press coverage before its release, estimates by the team were increased to roughly 500,000 copies, David Brevik later said. Pre-orders had surpassed 450,000 units globally by December 17, at which point the game was set to launch with a shipment of 500,000 units staggered across its initial days on shelves. Diablo debuted at #1 on PC Data's monthly computer game sales chart for January 1997. It held the position for another three months, before being displaced to #2 by X-Wing vs. TIE Fighter in May. Diablo remained in second place until September, when it dropped to fifth. It exited the top 10 that October. In the United States, the game was the highest-selling computer title of the first six months of 1997. Its worldwide sales surpassed 500,000 units by April, 750,000 by June and 1 million by late November. By the end of 1997, Diablo had sold 670,155 copies in the United States alone. It was declared the country's fourth-best-selling computer game of the year by PC Data. Schaefer attributed the game's success in part to its December 27 shipment date, and noted that "there weren't any other games released after Christmas, so we were the only game in town for a long time." 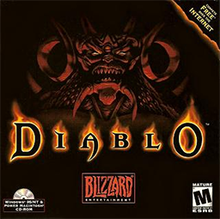 After being absent from PC Data's charts during the final months of 1997, Diablo took 13th place in the rankings for February 1998. It remained in the top 20 for another month, dropped out in April and reappeared in June. It returned to the top 10 from July through October, rising to #3 in August. For the first half of 1998, it was the United States' 14th-best-selling computer release. At the time, Jason Ocampo of Computer Games Strategy Plus called Diablo one of the charts' " 'perennial' inhabitants", and compared its longevity to that of Myst and NASCAR Racing 2. The game's average sale price during the January–June period was $36; by October, it had fallen to $26. Diablo finished 11th for the year in the United States, with sales of 354,961 units and revenues of $9.57 million in the region. In August 1998, Diablo received a "Gold" sales award from the Verband der Unterhaltungssoftware Deutschland (VUD), indicating sales of at least 100,000 units across Germany, Austria and Switzerland. Diablo's global sales reached almost 2 million units by September 1998. One year later, its sales in the United States alone had grown to 1.17 million copies, which made it the country's seventh-highest computer game seller since January 1993. This number rose to 1.3 million copies by March 2000. Remarking upon these sales, GameSpot's writer Desslock hailed Diablo as an "undisputed commercial blockbuster". The game returned in 2000 to PC Data's annual top 20 for the United States, with 260,020 copies sold. Worldwide, Diablo broke 2 million sales by mid-2000 and reached 2.3 million by January of the next year. Ultimately, the game sold over 2.5 million units by mid-2001. Diablo has received critical acclaim, with an average rating of 94/100 on Metacritic. Most praised the game's addictive gameplay, randomly generated dungeons, superior graphics, moody musical score, and great variety of possible magic items, enemies, levels, and quests. This last aspect was noted by GameSpot editor Trent Ward in his review: "Similarly, although a set number of monsters is included, only a few will be seen during each full game. This means that players going back for their second or third shot at the game will very likely fight opponents they haven't seen before. Talk about replay value." Reviewers commonly cited the online multiplayer aspect as one of the strongest points of the game, with it being described as greatly extending its replay value. Columnist Bernard Yee commented that compared to contemporary online multiplayer games such as Quake, Diablo gives newcomers a much better chance of enjoying themselves, as they can either cooperate with other players or build their character so that they can hold their own against hostile players. Computer Games Magazine's Cindy Yans said that "weapons, armor and items are so numerous that you're always acquiring something new to try... not to mention the game's multiplayer universe"; she went on to say that "for anyone who enjoys a good multiplayer dungeon crawl, Diablo can't be beat". Yans finished her review, "Despite the rather pale storyline, [...] watered-down quests and a fair amount of necessary repetition, Diablo is a must for anyone interested in 'just plain fun.'" Ward stated: "Diablo is the best game to come out in the past year, and you should own a copy. Period." Macworld's Michael Gowan wrote, "The only downside to this role-playing game is that the adventure ends too soon." Steve Klett's review for PC Games, which was reprinted in sister magazine GamePro, commented that "Diablo's definitely not your typical dungeon hackfest. ... In fact, its closest rivals are games like Gauntlet and Loaded on the PlayStation, but they really don't compare." A Next Generation critic similarly remarked that Diablo is more of a modern incarnation of Gauntlet than an RPG, "but with enough changes and improvements to make it a completely new experience, and one of the best titles so far this year." Diablo won the overall "Game of the Year" awards of Computer Gaming World, GameSpot and Computer Game Entertainment for 1996, and was a runner-up for Computer Games Strategy Plus's award in this category. The editors of Computer Gaming World wrote, "For this year, Diablo is the game that everyone will remember." It was also named 1996's best computer role-playing game by GameSpot, Computer Game Entertainment and Computer Games. While it was nominated for Computer Gaming World's "Role-Playing Game of the Year" award, the publication gave the honor to The Elder Scrolls II: Daggerfall. In 1998, PC Gamer declared it the 42nd-best computer game ever released, and the editors called it "a nearly flawless gaming experience". In 2005 GameSpot chose Diablo as one of "The Greatest Games of All Time". It was placed at No. 20 on Game Informer's "Top 100 RPGs Of All Time" list. The expansion pack made for Diablo is Diablo: Hellfire, released in 1997. It was produced by Sierra Entertainment rather than an in-house Blizzard North development team. The multiplayer feature of the expansion pack was disabled with version 1.01. The added content included two additional dungeon segments located within a new side storyline, several unique items and magical item properties, spells, and a fourth class, the Monk. There are also two unfinished "test" classes (the Bard and Barbarian) and two quests which could be accessed through a configuration file modification. Blizzard sold exclusive worldwide rights to develop, publish, and distribute console versions of the game to Electronic Arts in 1996. In 1998, a PlayStation version of Diablo was released, developed by Climax Studios and published by Electronic Arts. The game lacked online play, but featured a two-player cooperative mode. Notable differences to the PC version include the auto-aiming for range weapons and spells and an option for increased game speed. It features an option to learn the story through a narrator without having to find the books in the game. The European PAL version is translated and dubbed into French, German and Swedish in addition to the original English. The PlayStation version was infamous because of its need for 10 blocks on a PlayStation memory card; the standard size of memory cards for the platform was 15 blocks. The game was re-released alongside Hellfire in a 1998 bundle, called Diablo + Hellfire. 1998's Blizzard's Game of the Year Collection contained copies of Diablo, StarCraft and Warcraft II: Tides of Darkness. The Blizzard Anthology (2000) contained Diablo, StarCraft, StarCraft: Brood War and WarCraft II: Battle.net Edition. The Diablo Gift Pack (2000) contained Diablo and Diablo II, but no expansions. The Diablo: Battle Chest (2001) contained Diablo, Diablo II and Diablo II's expansion, Lord of Destruction. Later releases of the Diablo: Battle Chest also have a strategy guide for Diablo II and Lord of Destruction, though subsequent releases do not include the original game, instead featuring Diablo II, its expansion, and their respective strategy guides. For Diablo's 20th anniversary, it was announced during BlizzCon 2016 that Diablo III would receive a free patch called The Darkening of Tristram that recreates the original game. The patch contains a 16-level dungeon, four main bosses from the 1996 version and special graphics filters and 8-directions limited movement like the original game. The test patch was released on November 11, 2016 on the Public Test Realm server. In March 2019, Diablo was made available for sale on GOG.com, which marked the first time Blizzard had released the game on a digital distribution platform. The release featured two versions of the game: The original 1996 version and a new DirectX-based version built in-house by GOG that features additional display and graphical options. ^ a b "Blizzard Entertainment: Legacy Games". Blizzard. Retrieved November 30, 2011. ^ Bailey, Kat (September 8, 2015). "In Their Own Words: An Oral History of Diablo II With David Brevik, Max Schaefer, and Erich Schaefer". USgamer. Gamer Network. Retrieved September 8, 2015. ^ a b David Brevik (2016). "Classic Game Postmortem: Diablo". Game Developers Conference. Retrieved May 29, 2016. ^ "Diablo - PlayStation - IGN". IGN. Retrieved August 23, 2013. ^ "BlizzCon 2016: Overwatch's Sombra revealed, Diablo returns, Hearthstone's Gadgetzan, and more". PC World. November 4, 2016. ^ "Diablo Hellfire Tomb of Knowledge - Bard". ladyofthelake.com. Retrieved May 16, 2012. ^ "Download Diablo 1". GameGoldies Review of Diablo. February 3, 2010. Archived from the original on August 1, 2012. Retrieved February 3, 2010. ^ Cain the Elder reveals to the player that his full name is Deckard Cain toward the end of the game. After picking up the Staff of Lazarus from the Vile Stand in dungeon level 15 for the Archbishop Lazarus Quest, the player can talk to Deckard Cain back in town to hear him say, "This does not bode well, for it confirms my darkest fears. While I did not allow myself to believe the ancient legends, I cannot deny them now. Perhaps the time has come to reveal who I am. My true name is Deckard Cain the Elder, and I am the last descendant of an ancient brotherhood that was dedicated to safeguarding the secrets of a timeless evil. An evil that quite obviously has now been released." In a video that was published to YouTube on October 6, 2008, this quote by Deckard Cain starts at the 0:10 mark of the video, and the quote ends at the 0:45 mark of the video. In a different video that was published to YouTube on January 11, 2012, this quote by Deckard Cain starts at the 15:57 mark of the video, and the quote ends at the 16:32 mark of the video. ^ a b c A video which was published to YouTube on October 6, 2008, shows the ending cinematic of the game. From the 4:11 mark of the video to the 5:22 mark of the video, the ending cinematic shows the hero take out the Soulstone from Diablo and put it in his or her forehead. From the 5:26 mark of the video to the 6:20 mark of the video, the narrator says, "The Soulstone burns with hellfire as an eerie red glow blurs your vision. Fresh blood flows into your eyes, and you begin to hear the tormented whispers of the damned. You have done what you knew must be done. The essence of Diablo is contained — for now. You pray that you have become strong enough to contain the demon and keep him at bay. Although you have been fortified by your quest, you can still feel him, clawing his way up from the dark recesses of your soul. Fighting to retain control, your thoughts turn toward the ancient mystic lands of the Far East. Perhaps there, beyond the desolate wastes of Aranoch, you will find an answer, or perhaps, salvation." ^ Maxwell, Ben (December 2015). "Collected Works: David Brevik". Edge (286): 88–94. ^ Grossman, Austin (2013). Postmortems from Game Developer: Insights from the Developers of Unreal Tournament, Black & White, Age of Empire, and Other Top-Selling Games. CRC Press. p. 80. ISBN 9781136064623. ^ Welsh, Oli (March 29, 2016). "The moment Diablo - and the action-RPG genre - were born". Eurogamer. ^ Saltzman, Marc (December 30, 1998). "Where Have All the Genres Gone?". CNET Gamecenter. Archived from the original on December 6, 2000. ^ Specifically, Barton states, "What is Diablo but an updated Telengard?" Matt Barton (February 23, 2007). "The History of Computer Role-Playing Games Part 1: The Early Years (1980-1983)". Gamasutra. Retrieved August 26, 2014. ^ Loguidice, Bill; Barton, Matt (2012). Vintage Games: An Insider Look at the History of Grand Theft Auto, Super Mario, and the Most Influential Games of All Time. CRC Press. p. 317. ISBN 9781136137587. ^ David L. Craddock (October 27, 2012). "Stay Awhile and Listen, Chapter 8: Condor and Blizzard lock horns over Diablo". DM Press. Retrieved December 13, 2014. ^ Blizzard Entertainment. "Blizzard Retrospective". YouTube. Retrieved June 22, 2015. ^ Goosebumps. "Thread: Jay Wilson responds to David Brevik interview". MMO Champion. Retrieved June 22, 2015. ^ a b "Blizzard Entertainment - 10th Anniversary Feature". Blizzard Entertainment. February 5, 2001. Blizzard North: Condor and Diablo. Archived from the original on April 2, 2002. ^ Staff (December 17, 1996). "Diablo Demand Skyrockets". Next Generation. Archived from the original on June 6, 1997. ^ Staff (May 1997). "READ.ME; PC Data Best-Sellers". Computer Gaming World (154): 34. ^ Staff (June 1997). "READ.ME; PC Data Best-Sellers". Computer Gaming World (155): 36. ^ Lee, Helen (May 1, 1997). "PC Data Releases Monthly Numbers". GameSpot. Archived from the original on March 6, 2000. ^ Feldman, Curt (June 3, 1997). "Diablo...Stayin' Alive". GameSpot. Archived from the original on February 26, 2000. ^ Staff (September 1997). "READ.ME; PC Data Best-Sellers". Computer Gaming World (158): 31. ^ Staff (October 1997). "READ.ME; PC Data Best-Sellers". Computer Gaming World (159): 46. ^ Staff (August 26, 1997). "Top Selling PC Titles". GameSpot. Archived from the original on March 11, 2000. ^ Staff (December 1997). "READ.ME; PC Data Best-Sellers". Computer Gaming World (161): 56. ^ Staff (January 1998). "READ.ME; PC Data Best-Sellers". Computer Gaming World (162): 56. ^ Staff (February 1998). "READ.ME; PC Data Best-Sellers". Computer Gaming World (163): 36. ^ Staff (September 12, 1997). "Game Sales on the Rise". GameSpot. Archived from the original on March 7, 2000. ^ "Blizzard Entertainment's Diablo Remains Number-One Selling Game" (Press release). Irvine, California: Blizzard Entertainment. April 8, 1997. Archived from the original on February 10, 1999. ^ "Diablo Hits 13 Million Games Played Over Battle.Net" (Press release). Irvine, California: Blizzard Entertainment. June 25, 1997. Archived from the original on July 4, 1997. ^ Walter, Barbara (November 28, 1997). "Battle.net Defines Its Success: Interview With Paul Sams". Gamasutra. Archived from the original on May 12, 2012. ^ Staff (April 1998). "The Best-Selling Games of 1997". PC Gamer US. 5 (4): 44. ^ Ocampo, Jason (1997). "The Top 20 according to PC Data". Computer Games Strategy Plus. Archived from the original on April 6, 2005. ^ Ocampo, Jason (January 20, 1998). "December's hottest games". Computer Games Strategy Plus. Archived from the original on May 2, 2005. ^ Ocampo, Jason (April 21, 1998). "Do the PC Data figures prove lower is better?". Computer Games Strategy Plus. Archived from the original on April 6, 2005. ^ Ocampo, Jason (May 13, 1998). "The top selling games of April, according to PC Data". Computer Games Strategy Plus. Archived from the original on February 8, 2005. ^ a b Ocampo, Jason (August 18, 1998). "SWAT 2 debuts at No. 5". Computer Games Strategy Plus. Archived from the original on April 6, 2005. ^ a b Staff (December 1998). "Playing Lately; PC Data Best-Sellers". Computer Gaming World (173): 56. ^ Staff (October 27, 1998). "PC Data Hit List for September". GameSpot. Archived from the original on March 9, 2000. ^ a b Feldman, Curt (November 13, 1998). "Top-Selling PC Games for October". GameSpot. Archived from the original on April 11, 2000. ^ a b Ocampo, Jason (August 17, 1998). "Sales rankings for the first six months of 1998". Computer Games Strategy Plus. Archived from the original on April 6, 2005. ^ Staff (April 1999). "The Numbers Game". PC Gamer US. 6 (4): 50. ^ "Uhr TCM Hannover – ein glänzender Event auf der CebitHome" (Press release) (in German). Verband der Unterhaltungssoftware Deutschland. August 26, 1998. Archived from the original on July 13, 2000. ^ "VUD Sales Awards: November 2002" (Press release) (in German). Verband der Unterhaltungssoftware Deutschland. Archived from the original on January 10, 2003. ^ "Diablo II, Sequel To The Number-One Selling Role-Playing Game, Debuts With 3Dfx Support" (Press release). London: Blizzard Entertainment. September 8, 1998. Archived from the original on February 18, 1999. ^ IGN Staff (November 1, 1999). "PC Data Top Games of All Time". IGN. Archived from the original on March 2, 2000. ^ Desslock (May 11, 2000). "Desslock's Ramblings – RPG Sales Figures". GameSpot. Archived from the original on February 3, 2001. ^ Staff (April 2001). "Top 20 of 2000". Computer Gaming World (201): 34. ^ "Diablo II Goes Gold" (Press release). Irvine, California: Blizzard Entertainment. June 7, 2000. Archived from the original on August 16, 2000. ^ "Diablo II Sells More than 2.75 Million Copies Worldwide" (Press release). Irvine, California: Blizzard Entertainment. January 25, 2001. Archived from the original on October 24, 2001. ^ "Diablo II: Lord of Destruction Goes Gold" (Press release). Irvine, California: Blizzard Entertainment. June 21, 2001. Archived from the original on December 1, 2001. ^ "Diablo for PC". GameRankings. CBS Interactive. Retrieved November 1, 2018. ^ "Diablo for PlayStation". GameRankings. CBS Interactive. Retrieved November 1, 2018. ^ a b "Diablo for PC Reviews". Metacritic. CBS Interactive. Retrieved November 1, 2018. ^ Fortune, Greg (March 1997). "Diablo Rules the Underworld". Computer Gaming World (152): 80, 81. ^ a b c d e f g h Ward, Trent (January 23, 1997). "Diablo for PC review". GameSpot. Retrieved June 7, 2018. ^ Smith, Josh (March 22, 1998). "Diablo Review". GameSpot. Retrieved June 7, 2018. ^ Wolf, Mike (March 1997). "Diablo". PC Gamer US. Archived from the original on November 16, 1999. ^ Davison, John. "Diablo Review". PC Zone. Archived from the original on October 27, 2010. ^ a b Gowan, Michael (February 1999). "Name Your Game; From Goofy to Gory, Macworld Reviews 48 Ways to Play". Macworld. Archived from the original on August 10, 2001. ^ a b c d e f g Yans, Cindy (1997). "Diablo". Computer Games Strategy Plus. Archived from the original on July 10, 2003. ^ Ryan, Michael E. (March 25, 1997). "After Hours; Devilishly Good". PC Magazine. 16 (6): 449. ^ a b c d e f Staff (April 1997). "Caliente". Next Generation (28): 130. ^ Klett, Steve. "Diablo". PC Games. Archived from the original on July 11, 1997. ^ a b c d e Klett, Steve (March 1997). "PC GamePro Review Win 95: Diablo". GamePro. No. 102. IDG. p. 56. ^ Yee, Bernard (April 1997). "Joyriding". Next Generation. No. 28. Imagine Media. p. 24. ^ a b Staff. "GameSpot 1996 Best & Worst Awards". GameSpot. Archived from the original on December 13, 2000. ^ a b c Staff (May 1997). "The Computer Gaming World 1997 Premier Awards". Computer Gaming World (154): 68–70, 72, 74, 76, 78, 80. ^ a b Staff (July 1997). "The Computer Game Entertainment Awards 1996". Computer Game Entertainment (1): 54–58. ^ a b "Computer Games Strategy Plus announces 1996 Awards". Computer Games Strategy Plus. March 25, 1997. Archived from the original on June 14, 1997. Retrieved November 2, 2010. ^ Colayco, Bob (July 1, 2005). "The Greatest Games of All Time - Diablo". GameSpot. CBS Interactive. Archived from the original on October 13, 2014. Retrieved July 17, 2015. ^ Game Informer Staff (January 1, 2018). "The Top 100 RPGs Of All Time". Game Informer. Retrieved June 2, 2018. ^ "Diablo Battle Chest". Gamespot.com. Retrieved May 8, 2011. ^ a b Machkovech, Sam (March 7, 2019). "Blizzard has handed Diablo 1's keys to GOG, and you can buy it right now". Ars Technica. Retrieved March 8, 2019. Wikimedia Commons has media related to Diablo (video game).